The latest offering from Kit Cosmetics is the gorgeous and glamorous Diamond Nail Bows (A$15.95/set of six), which reminds me a lot like the glitz and glam on the set of The Great Gatsby movie! This set features six diamond nail bows, nail glue (1ml) and glue remover (5ml). These diamond nail bows are the cutest nail embellishments to add some bling bling to your nails! 1) Apply a base coat to protect and strengthen your nails - I used Manicare Base Coat & Strengthener (reviewed here). 2) Paint your nails - I'm wearing the shade Monroe by piCture pOlish. 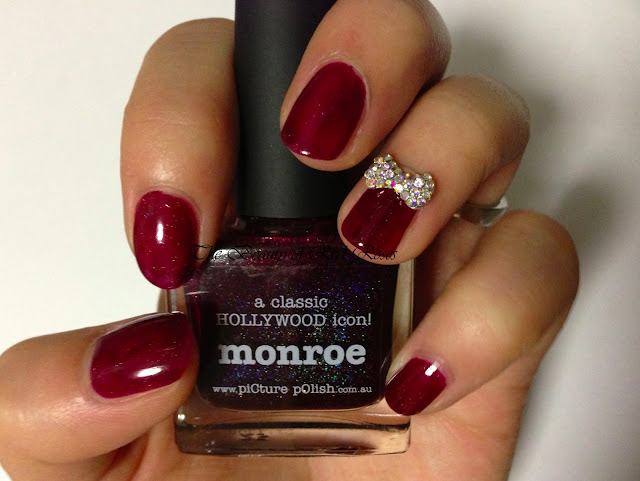 The shade Monroe is one of my favourite red shades as it looks so elegant and feminine on my nails. Monroe is described as a blood red jelly which contains minuscule iridescent holographic shimmers. The quality if great and the formula is excellent, where the consistency is not too thick and the finish is ultra smooth and reminiscent of jelly! 3) Place a small amount of nail glue to the bed of your nail and hold the diamond nail bow in place for a few seconds until the glue has dried. 4) To remove the diamond nail bow, use the glue remover provided or alternatively use regular nail polish remover. Voila! These diamond nail bows are so easy to apply and they sit nicely on the nail bed. They add a touch of spark and are just so adorable! I've already received compliments after wearing them on this morning! Kit Cosmetics Diamond Nail Bows are limited edition and currently available at Kit Cosmetics, Mecca Maxima, Mecca Cosmetica and selected Myer department stores nationally. 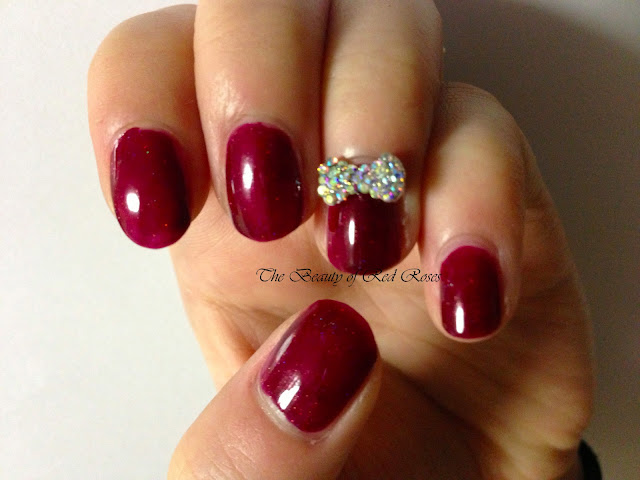 Have you come across these gorgeous diamond nail bows before? I saw these in store the other day, they are amazing! They are just sooo pretty! !